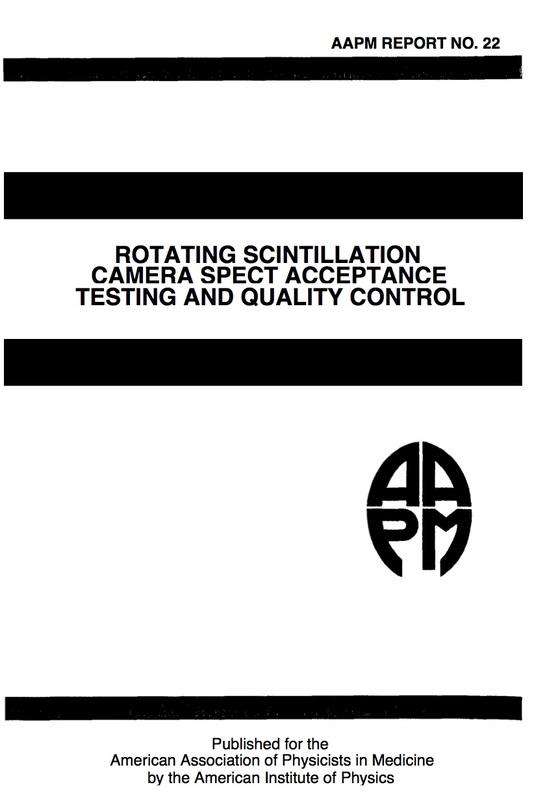 The purpose of this document is to present a uniform set of procedures that can be used for acceptance testing and quality control of a scintillation camera-based SPECT system. Emission computed tomography has a number of advantages over conventional nuclear medicine imaging: 1. Contrast improvement 2. Total volume imaging 3. Quantitation a. Detection of lesion and its location b. Determination of length and volume c. Absolute regional radionuclide concentrations In order to realize these advantages. strict quality control procedures must be performed on a routine basis. Important considerations for tomography. unlike planar imaging. include levelness of gantry. collimator hole angulation, strict attention to field uniformity, attenuation correction, filtering. and camera response at different angular orientations of the camera head. In addition, both linear and angular sampling are of concern: use of the finest matrix size and angular sampling are recommended. Using a 64 x 64 acquisition matrix will make certain measurements unrealiable. e.g.. resolution and linearity. If the system is capable, a minimum matrix size of 128 x 128 (3 mm linear sampling, 400 mm FOV) should be employed. Angular sampling can be performed with either a continuous rotation or "step-and shoot" acquisition using a circular or noncircular orbit. Tomographic techniques are very sensitive to inadequate calibration procedures. Additional time must be set aside for the quality control of SPECT studies in order to ensure artifact-free images. As a caveat. if the measurement protocols described herein are to be used for acceptance testing, then the burden is upon the prospective buyer to negotiate the performance specifications with the manufacturer prior to the submission of a purchase order.